It’s a bit dull going through a neighborhood and seeing the same perfectly preened landscape, with very little personality and character. Break the mold, and hijack your current landscape in 2017. As long as you follow the regulations set forth by your local homeowner association, then do not hesitate to step a little bit of the box with these design ideas. Sometimes called an alpine garden, rock gardens combine hardscape and strategic planting to create a little Zen spot in your front or back yard. Remove debris with a leaf blower and use a shovel to dig up any bushes. Use spray paint to mark a design on the plotted land. Pick different sizes of stone for the rock garden. Choose plants suitable to the current climate, ensuring that the plants have different textures and flowering patterns to add variety to your rock garden. Create a riverbed with the help of small bushes like a Juniper and small boulders. Use additional plants to surround this simulated riverbed. You can also create a walkway throughout the rock garden, making sure that the stone slates you used to create the passageway contrast this mock riverbed. Now you have a garden, without the maintenance of a traditional green way. If your property has a severe hill, then several landscaping methods can be used to tame them. Build a stone retaining wall to add a touch of elegance to your property. You can also use a water feature like a pond or a stream. Since these water features require a slope, your hilly backyard will act as the ideal framework for man-made streams. If you do not want the time investment of a pond, you can dress up a hill by displaying your favorite containers. Take advantage of the slope of your hill with a few potted plants. Consider planting native plants to have something akin to a natural, colorful oasis right in your yard. The University of Minnesota has a list of native plants that you can use for your landscape that will work well for this project. With a bit of preparation, even the smallest yard area can be elevated into one designed for leisure and relaxation. Think of the function of your backyard – and now equip it with the accessories and the furnishings it needs to do that function well. For example, if you envision that your deck area will be a place where family and friends can go to eat for lunch, then install a large dining table as a centerpiece, with plush seating areas that allow for lounging. 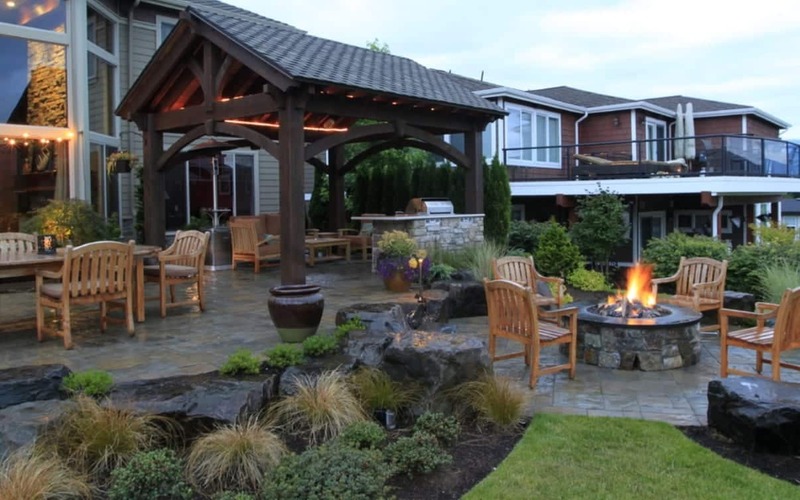 You may also consider a fire pit – it is versatile, relatively easy to install, and doesn’t require much upkeep. For cramped quarters, consider going vertical – plants of varying lengths, wall gardens, and tall perennials will naturally guide the eyes upwards, making even smaller spaces feel significantly spacious. If you’re blessed with ample backyard space, then the concept of the “functioning” yard still applies. You can make it a tranquil oasis where you can declutter with the help of a garden. Consider making pathways with stepping stones or pavers that will give an expansive, open space a bit of direction. Adding a unique shape to your green lawn is a relatively simple process that can add a unique touch to your outdoor spaces. Once done, they are eye-catching. All you need is a string, spray paint, a cutting tool, a flexible edging material. You can then fill empty spaces with gravel sand, soil, or any other substrate that will complement the rest of your landscape. 2017 is the year where you can be a bit more adventurous with the landscape and accessories in your outdoor spaces. If you think a fixture will be a bit jarring, then do not be afraid to ask the opinion of your neighbor or your community’s HOA.